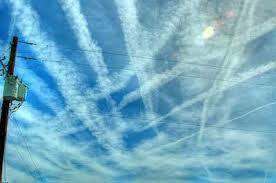 What do you know about the planes above us spraying chemicals into the sky? Do you know anything about what is being done everyday over your head and what happens to those trails of smoke after they disperse? If you’re someone who keeps his/her head buried in the sand or just claims its another conspiracy theory, then maybe its time to invest an hour or so of your life before American Idol or the Housewives of Orange County to gather info and make your own informed decision about what is definitively having a negative affect on us all. I’m doing my share. How about you??? ?